Jeffrey J. Meyers. 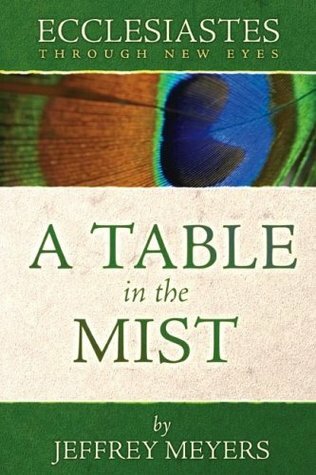 Ecclesiastes Through New Eyes: A Table in the Mist. Athanasius Press; Monroe, Louisiana. 2006. Kindle Edition (2013). The key term used throughout Ecclesiastes is the Hebrew word hebel. Poor translations render this word as “meaningless” or “vanity.” A better translation, Meyers’ suggests, is vapor, “shepherding the wind.” The point of Solomon’s lament (“vapor of vapors, all is vapor”) is not that life is meaningless or vanity. Solomon is saying, as he will develop throughout the book, that all man’s attempts to gain leverage, to get an advantage over nature and the world, are like attempting to shepherd the wind. Man is not in control. God is in control. Man does not govern the course of history and events. God does. Wisdom is recognizing the all-encompassing providence of God, and to stop trying to grab it for ourselves. This reality is freeing—God is in control, and we cannot manipulate His creation through our efforts. Wisdom recognizes that the world is unpredictable. From a human perspective, the world often makes no sense. The wicked prosper, and the righteous suffer. Even wisdom can be disregarded and spoiled. How does the mature Christian, acting in faith toward God, understand these things? Wisdom reminds us that God is in control, and that all men will be judged. Either in this life, or the next, God is just. There is cosmic justice. Furthermore, God has a plan that we cannot see. His was are inscrutable, and they exist none-the-less, and His purposes are good. The eye of faith sees these truths, and is at peace living in light of them. Another important aspect of wisdom is knowing our place. Solomon makes this point repeatedly throughout Ecclesiastes. We are to know our place before God as His creatures; He is our Maker. We are to know our place before others, as we participate in community. We are to know our place in the worship of God, and act appropriately in the presence of His people. We are to know our place before kings, knowing when to speak and when to remain silent. There is much wisdom in recognizing, first that God is in control of our lives, and second, how we are to respond to the places and positions God has placed us in. Knowing our place does go beyond the community and how we interact with others, however. A major theme in Ecclesiastes in recognizing that our work, our vocation, also comes from God. Because it comes from God, we are to engage in it with all our might and leave the rest to God. No job is too menial for the Christian to perform with all his or her might, and more importantly, to enjoy. While the world is constantly worrying about their status and position, the Christian can rest in God’s sovereignty for those things, and simply work hard and enjoy the fruit of their labors. Here is wisdom on Monday morning. A recent trip into a local used book store surprised me. There was a small shelf labelled, “preparing for death.” I was surprised the shelf was there at all, and certainly less surprised to find only two or three books on it. People today do not think about death. We don’t like to think about death, and this is because, Solomon would tell us, we are fools. Wisdom contemplates death, not in a morbid way, but in order to gain perspective. Wisdom looks at the reality of the sinful world in which we live. Wisdom is not self-deceived about the shortness of life, and the complete unpredictability of it. People do not control their own death, nor can they honestly predict it. God controls these things. Wisdom, however, recognizes the inevitability of death and lives in light of it—learning to make the best use of time, for the days are evil (Eph. 5:16). Perspective on the shortness of life, the hebel-ness of it, is a great motivation for living in wisdom. Recognize your place in the world. Trust God’s control of all things. Enjoy your work and fruit of your hands; eat, drink, and be merry (not because “tomorrow we die”) for God rules and reigns, and has given you good gifts to enjoy. Meyers’ makes this point emphatically, and it is a good one. Solomon makes it repeatedly. Enjoy life as a gift from God. Throughout the entire book, Meyers’ is making the argument that Solomon is recommending, above all else, the life of faith. Because the world is unpredictable, because man cannot manipulate it, man is to trust God. God created the world, governs the world, and gives purpose to the world. Man does none of these things apart from almighty God. Man’s attempts to give purpose to the world are like shepherding the wind. Ecclesiastes is a full blown assault on humanism. Rather than placing faith in man, which is an evil under the sun, place faith in God. Faith in God, not only means recognizing His control, power, and justice, but also means recognizing that God’s law must govern our lives. Live joyfully under God, working hard, enjoying life, and following His law. Therein is true wisdom. Overall, I would definitely recommend this book to you. Read it, but more importantly, read Ecclesiastes. Read and reread that. This book, while I had some minor concerns, was very helpful in laying out the major themes I discussed above. Ecclesiastes can make Christians uncomfortable, and Meyers’ emphasizes those points (gently) in order to help us begin to think less like Westerners and more like Christians. That, too, is wise. This entry was posted in Biblical Study, Book Reviews and tagged Biblical Interpretation, Christianity, Commentary, Wisdom Literature, Worldview. Bookmark the permalink.